We are looking for proposals from artists and collectives to be 'in residence' in our gallery from 13th May - 30th June 2019. The Collection is looking for proposals from artists and collectives to be 'in residence' within our temporary exhibition space, the New Curtois Gallery, for a period of 6 weeks from Monday 13th May - Sunday 30th June 2019. 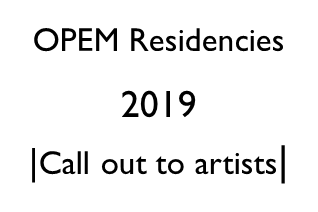 Following on from the success of residencies and site-specific commissions developed during our series of biannual OPEM exhibitions, these OPEM Residencies aim to support and champion the work and development of artists working in the region. We aim to run three residencies simultaneously in the space, showcasing three different practices. Though working independently, collaboration and sharing is at the centre of this project and the artists in residence will have opportunity to collaborate on engagement activities where possible. We are looking for proposals from artists who are interested in responding to our collection, current and ongoing projects and the museum environment, opening up new discussions and developing and initiating audience engagement opportunities. This opportunity is open to artists, groups and collectives at different stages of professional development who are based in the East Midlands. For more information on previous exhibitions and artist development opportunities, please see our Previous pages on our website. N.B. *These residencies will be uniquely public, with the artists working in an open gallery space, interacting with visitors to the site. *There is no restriction on the artistic practice represented in the space and we encourage applications from all different artistic practices, though we do ask that before applying you take into careful consideration the environment and the audience demands. Join us on a preliminary planning day for the residency, meeting staff and looking at the residency space. Artists will be expected to spend time equivalent to 2 days per week for 6 weeks on site undertaking research, meeting staff and creating work in the gallery space. We understand that time and resource limitations mean that you may not be able to evenly spread 2 days per week across 6 weeks; please detail this in your application. We also understand that you may wish to spend longer than 2 days per week in the space; this can be discussed further at point of appointment. Plan and undertake one schools activity with the Learning Team. Plan and contribute to CPD activity for Teachers in collaboration with the Learning Team. Contribute to the ongoing interpretation of the residency, with engagement with the public during exhibition open hours and a weekly 'meet the artist' session. Contribute to the closing event/symposium/talk - content and structure to be confirmed during residency. a single fee of £1600 for 2 days per week for a period of 6 weeks (which works out to £133/day). The Collection cannot offer any extra support for accommodation or sustenance. up to £100 to support pre-residency research and preliminary site visit. up to £500 production stipend for the creation of new work. This work will be displayed within the gallery during the residency period. reasonable access to workshop facilities, to be negotiated with onsite technicians. weekly meetings with the Exhibitions and Interpretation Team during the residency period. one meeting with a Collections Curator during the residency period to enable and further research. Please send your application to Jenny.gleadell@lincolnshire.gov.uk by Monday 24th September, 5pm. Your application will be assessed by a panel of museum staff, representing the key areas including Front of House and Invigilation, Learning, Collections and Exhibitions staff. An estimated budget detailing how you would use the production stipend.